18 Months - $80.99 Only 2 left! 2T - $80.99 X-Small (4 - 6) - $80.99 Only 3 left! Owls are normally dark and gloomy colors so that they can blend in with the night while they hunt for prey. Your kiddo is so cute, though. Why would you dress her up as something so dark and eerie? 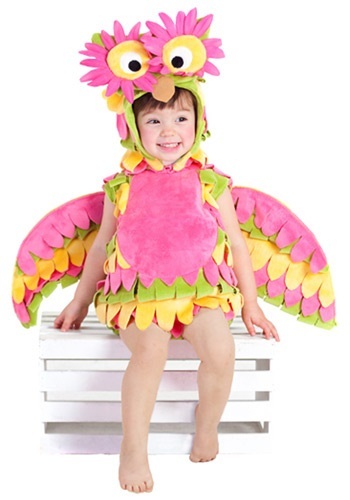 Grab this Little Colorful Owl Costume and let your cutie have a hoot this Halloween! When you slip your little girl into this romper, she will look like an owl from a tropical rain forest. She can fly all around the neighborhood this Halloween, gathering up plenty of delicious treats. Normally when one sees an owl, fear is the first feeling that enters their mind but when your friends and family see your colorful cutie, they’ll feel nothing but joy! The multicolored wings and the big flowery eyes transform your youngster into a majestic and almost magical looking bird. The only thing prettier than this cute costume will be the huge smile on the face of your little girl. Even though she’ll be dressed as an owl, she sure will be chirping like a songbird this Halloween. So make sure that you have your camera ready. Before you know it your little owl is going to grow up and leave the nest, so you’ll want to make sure that you have plenty of these precious moments captured on film. Let your little girl have a hoot this Halloween. Add this Little Colorful Owl Costume to your cart as well as a pair of pink tights and she’ll be ready to flap her wings. All you need to do is be the wind beneath her wings!